If you are a little flush this month and have a spare £13k burning a hole in your pocket, then why not go out a buy a bike. Let's face it you probably have the skis to match. The bike is made by German car firm Audi in collaboration with carbon fibre specialists Lightweight. The Audi Sport Racing Bike was unveiled in Japan and only 50 will be available. The cycle uses a lightweight carbon fibre frame that weighs 790 grams – around the weight of five iPhone 6 Plus smartphones. The carbon fibre is called T1000 (not after the Terminator movies) and is made by Japan's Toray Industries. It's the same stuff used in Audi's racing cars. The frame and forks come in an “exclusive” Audi design and it also features a Selle Italia carbon saddle with Audi Sport covering in Fine Nappa leather from R8 Production. With the rest of the bike thrown in, it weighs 5.8kg in total. 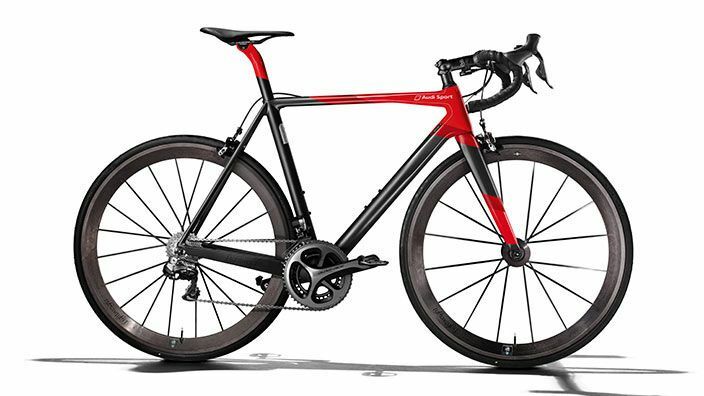 An Audi spokesman told the Wall Street Journal that it is “extremely rare” for a bike to weigh less than six kilos. The bike was announced in March but has only just gone on sale this week. The bike can be bought online here by request only. But if you can afford £13,000, then you will probably have your butler take care of ordering this pushbike.